Today’s image, The Discovery of the Gunpowder Plot, was not created by me, but rather by Henry Peronett Briggs in 1823. This is the moment where Guy Fawkes was caught in his attempt to blow up Parliament. When writing abour Gratis vs Libre, I talked a little bit about compromise. It’s likely that we will need to reach a compromise with the MPAA and RIAA at some point. 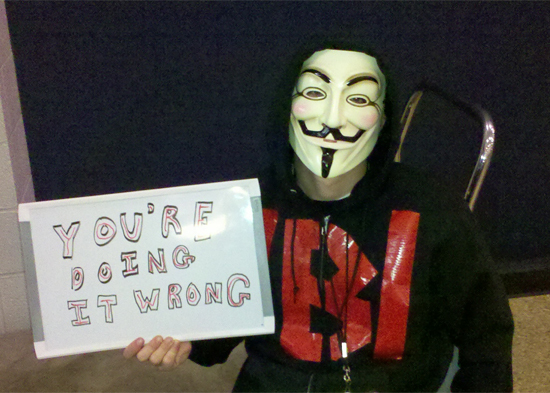 With that in mind, I’d like to say one thing about Anonymous and their recent attack on the UFC. I wrote a while back that I hate bullies, and I think it’s often a great thing when the bully gets a taste of his or her own medicine. Often, Anonymous is the one that gives the bully his or her due. When an officer decided to repeatedly pepper spray peaceful protesters, for example, Anonymous made sure that everyone knew who he was. Unfortunately, the bullied often become the bullies. That is, they leap from realizing that the bully has no power over them to thinking they have power over the bully. This is what has happened with Anonymous and the UFC. Granted, it appears that it didn’t start with Anonymous; apparently some other hacker group initially hacked the UFC site because of the UFC’s support of SOPA. Then, when Dana White expressed anger over it, his personal information was released. Only it wasn’t just Dana White’s information that was released. The information mistakenly also included the phone number of a woman who was completely uninvolved in the incident. Apparently, the previous owner of her home had a white cat named “Dana,” and had junk mail sent to the name “Dana White.” The threats she received over the phone and by e-mail had her so frightened that she was afraid to answer her door without a gun. But the point here is not the sloppy, wanton release of information. The point is that in the arena of ideas, bullying is not the way to convince people that you are right. The UFC, Dana White, and anyone else who supported the SOPA bill haven’t beaten anyone up – or at least anyone who hasn’t signed a contact to fight. They haven’t sprayed protesters in the face with pepper spray or even make a personal threat (EDIT: In the case of the one officer that did make a threat, Anonymous was right to report him to his employer). They simply expressed an idea and their agreement with that idea. If you disagree with their idea, then you should discuss that disagreement, not bully them into compliance. I’ll put it another way: a thousand sites voluntarily taking their pages down for a day had a greater ability to influence the world than anything Anonymous has ever done. With the January 18th protest, Wikipedia and other sites were able to show them why they are wrong, not just threaten them with violation of their privacy if they don’t change their minds. They met their opponents in the arena of ideas and won without harming anyone else. The lesson to take away from this is simple: there’s nothing wrong with defending people against bullies, as long as you don’t become a bully in the process.